All our event highs and innovation milestones captured in this 2min showreel. Check it out! Circus Maximus is an integrated creative and production agency with a strong foundation in event management. Of local origins with a global perspective, our clients are established brands and MNCs for whom excellence and professionalism are non-negotiable. They are our priority. We bring their vision to life by providing effective solutions encompassing creative designs and innovative ideas coupled with advanced technology and thoughtful, relevant content. We understand the importance of investing in event technology and keeping abreast of industry happenings. After 18years in the business, we are still evolving - an `ideas’ factory that’s constantly thinking of new ways to stay ahead of the competition and to remain relevant. Every project in a collaborative and consultative manner ; listening to understand your brand and key objectives. In creative partnership with our clients, suppliers and each other. Our client’s challenges become ours and their goals and aspirations drive us forward in the pursuit of excellence. Are our most treasured resource so we strive to create a great place to work, where people are nurtured and inspired and their passion, encouraged and honoured. Fast becoming a mainstay of events, projection mapping has proven effective in creating a more dynamic and engaging event experience for our audiences. From videos to artistic performances and corporate presentations, we ensure content is created and relayed effectively to drive messaging and marketing objectives. An in-house creative team ready to blow your minds with their designs. Evoke. Excite. Elicit - what we strive to achieve with our videos. 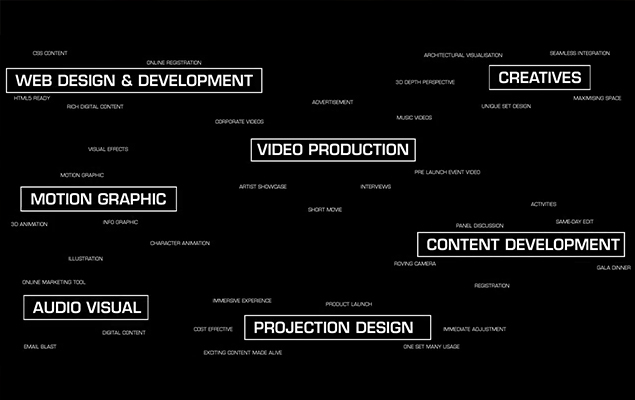 Our design team understands the importance of using motion graphics to bring your vision to life. Often, an event can be spoiled by bad sound and video. Using our top of range equipment, let our av specialists take care of all your technical needs while you sit back and relax. Event microsites and online registration platforms- all created in-house to help you drive traffic to your events. In this digital age, events are no longer one dimensional. We understand how to integrate various mediums for maximum impact. © Circus Maximus International, 2017.